Stay and Play in Door County this Memorial Day and SAVE! 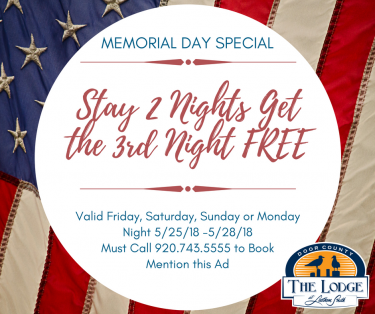 The Lodge is offering a great Memorial Day lodging special Friday evening through Monday evening of the Memorial Day Weekend…Book a 2 Night Stay, Receive the Next Evening Free. This special Memorial Day Lodging offer is valid by calling us directly and mentioning this ad. Call 920.743.5555 to book your stay. The Lodge offers a FREE Continental Breakfast for our guests making your stay even more affordable. Our location makes us even more desirable as you can easily enjoy all that Sturgeon Bay has to offer. We’re a short drive from all the other attractions that make Door County special this time of year. The Lodge also offers FREE Boat Launching at the marina in front of our resort. So if you love to fish or just love being on the water, be sure to bring your boat and bask in the glory of all the surrounding waters of Door County. From the marina, you can either boat out the canal to Lake Michigan or boat out to the Bay of Green Bay. If the weather is a bit rough you can always boat in the canal. Take in the Memorial Day Events in Door County including but not limited to: Jacksonport’s Maifest celebration with a parade and car show, Sturgeon Bay’s Fine Art Fair, and more. Memorial Day always kind of signifies the unofficial start of SUMMER in DOOR COUNTY!